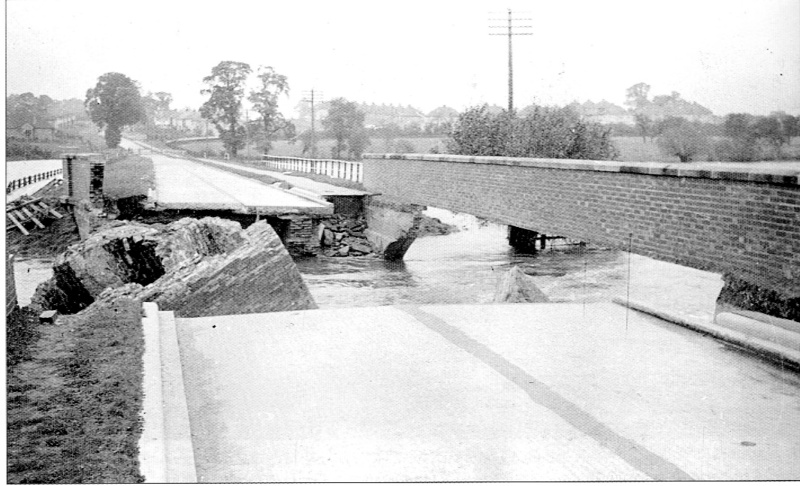 My attention has just been drawn to the Haversham Bridge when I was reminded that the older road bridge was washed away in a flood in 1939. This photograph, taken on October 18th 1939 from the Wolverton side, shows the result. This bridge was then replaced by a “Bailey Bridge”. These were a wartime cantilever design used by the army in WWII and it was a fast and sensible solution to link Haversham and Wolverton – and Castlethorpe and Hanslope too. Unfortunately this temporary solution, which was a very narrow bridge, lasted for about 20 years. Two small cars, say Austin A30s, could pass, but for a van or lorry it was a single lane. Traffic was very light in those days and so no traffic lights were needed. In about 1958 or 9 work started on a new bridge. The contractor, Caffins, had their trailer parked there for a least a year and it seemed to me that the building took an extraordinarily long time. As I say, traffic was light in those days, so it was not a major inconvenience. Two of Wolverton’s most notorious drunken roustabouts worked on this project. I won’t mention their names, but you could pick up the Wolverton Express on any given week and find one or the other up on a charge of assault or affray in the Magistrate’s Court. I am told that they were barred from most pubs in the district. The road to Haversham was re-routed several times. 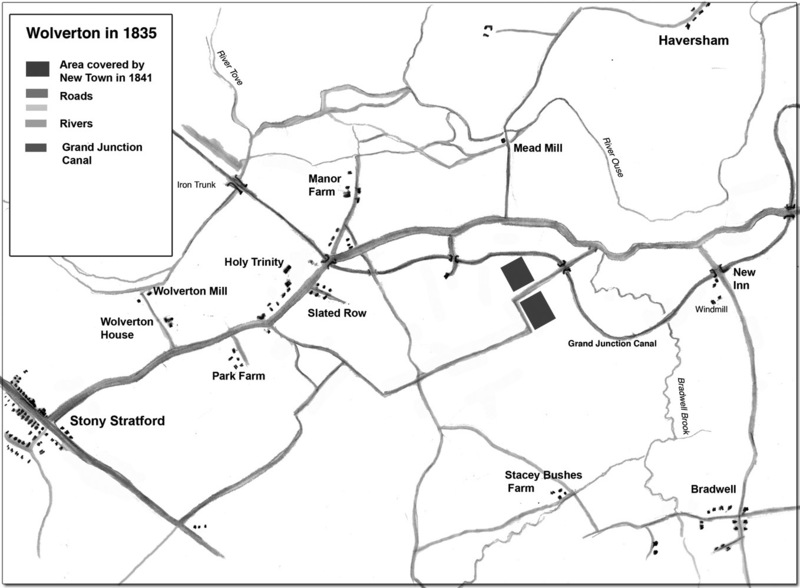 Originally it turned off the Old Wolverton Road to the west of the old railway line and crossed the river beside Mead Mill. 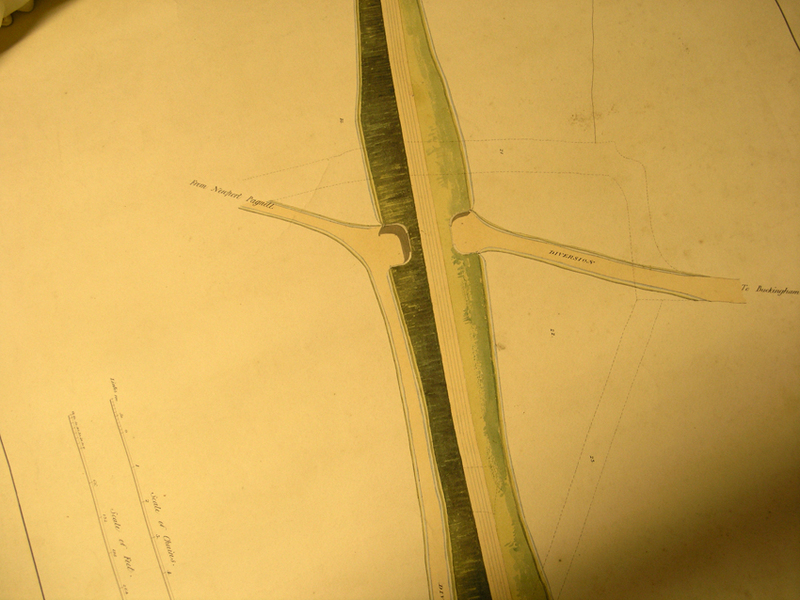 The drawing below, prepared by George Stephenson, shows the diversion and takes the new road alongside the east embankment, probably joining the old wooden bridge shown in the engraving further below. As you can see from the pencil marks the route of the old road was typical in that it went round fields rather than cutting a straight path. The new viaduct and railway line did bring about some straightening. After the loop line was constructed in 1881 (now the present railway line) the road was moved again, now joining the Bradwell-Wolverton Road half way up the hill by the Drill Hall. It is possible that a newer bridge on brick pillars was built at this time. Mead Mill had in any case been abandoned at this date and there was no need for the bridge to be closer to the viaduct. 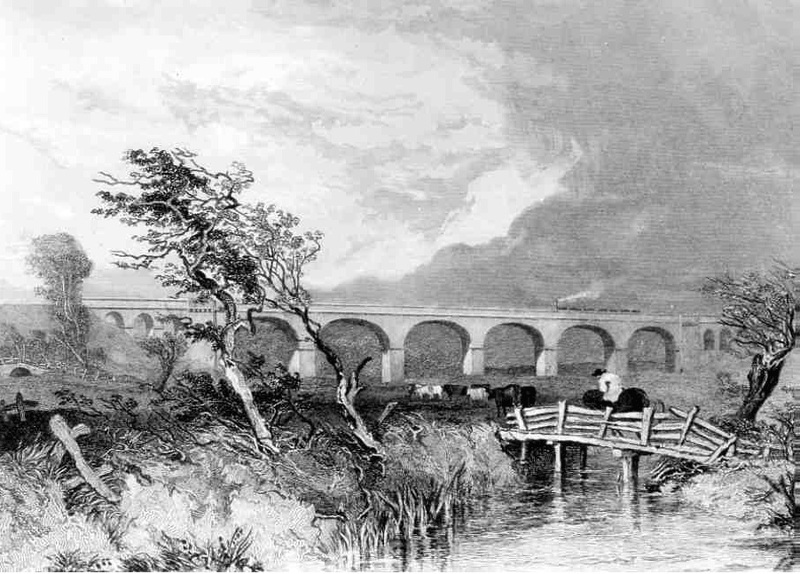 And finally, a view from an engraving of 1839, which shows a ramshackle old wooden bridge that probably served well in the era of horse and cart.